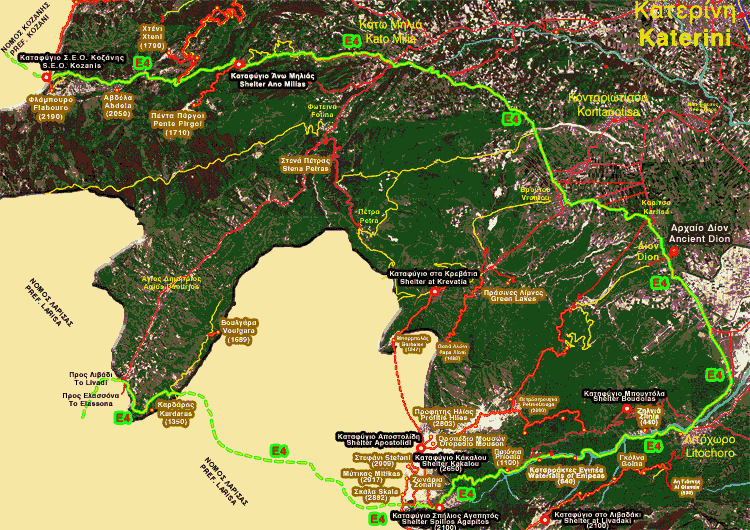 The European Mountain Path E4, which starts in the Pyrenees and ends up in Greece at the White Mountains of Crete, crosses Mount Olympus and the mountains of Pieria. In the Mountains of Pieria it crosses the peak "Flambouro", "The Plateau of Avdella", the villages of Ano and Mesea Milia, reaching Kato Milia. As it continues its way towards Olympus it passes through the villages of Lofos, Vrondou, Karitsa and Dion before reaching Litochoro. From Litochoro it passes through the magnificent "Enipeas Gorge" and the old monastery of Agios Dionisios. (4 hours). It then follows the route "Prionia" - shelter "Spilios Agapitos" - point "Scala" - peak "Skolio", ending this section of its route at the village of Kokkinoplos on the Thessalia side of the mountain. From here it continues towards Southern Greece, reaching the Taygetos mountains in the Peloponnese and on to the "White Mountains" in Crete.